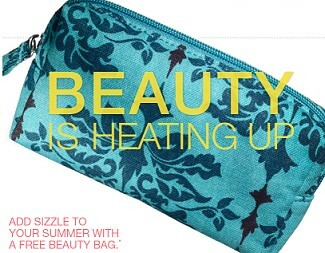 Simply Beautiful: FREE Target Summer Beauty Bag! I love Target! Its one of my favorite stores to go and browse and shop. I also love shopping Target's beauty section since they have expanded and included lots of other brands that are different from the regular drugstore brands. Those include Elf, Jemma Kidd, Pixi, and Sonia Kashuk. Every season Target comes out with a Free Beauty Bag up for grabs either on their website or on Facebook. This bag includes deluxe samples for hair, makeup, and body. They also include coupons in the bag as well which is great for me because I love to coupon. So right now up for grabs on their Facebook, Target Style is giving away their Summer Beauty Bag. The contents will remain secret until we receive them but I'm sure it will be great as always. These run out fast, so sign up and get them! Like them here and request for your bag!! I just signed up for mine earlier today! Can't wait to see what's inside this year's bag. This is awesome and definitely signing up.